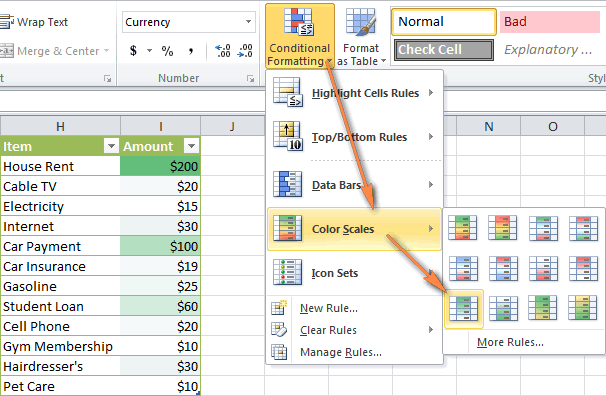 The article provides the detailed guidance on how use conditional formatting Icon Sets, Data Bars and Color Scales in Excel 2016, 2013, 2010 and 2007. It will teach you how to extend these conditional formats beyond their common uses and apply icons based on another cell's value. Last week we started to explorer various features and capabilities of Conditional formatting in Excel 2016, 2013 and 2010. If you have not got a change to read that article, you may want to do this know. If you already know the basics, let's move on and see what format options you have with regard to Excel's icon sets, color scales and data bars and how you can leverage them for your projects. 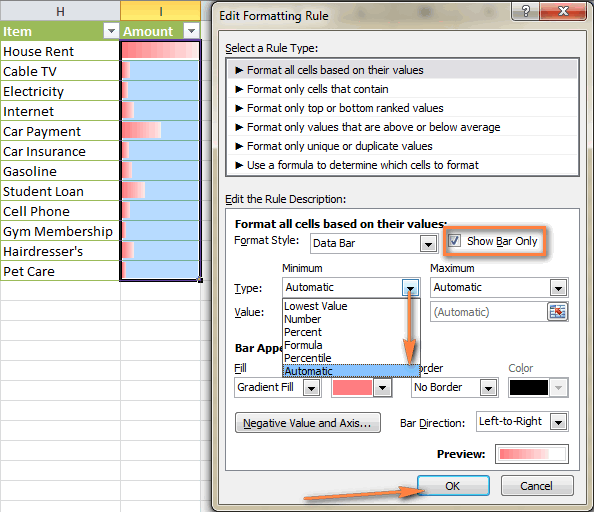 When you click the Conditional Formatting button, a drop-down menu offers you a handful of pre-defined formatting rules. Let's quickly go through them, one at a time. Excel conditional formatting icon sets will help you visually represent your data with arrows, shapes, check marks, flags, rating starts and other objects. You apply the icon sets to your data by clicking Conditional Formatting > Icon Sets, and the icons appear inside selected cells straight away. In the screenshot above, you can see a table listing the household spendings with a green circle representing the highest value and red circles lower values. I cannot say that Excel has interpreted the data in the way I wanted, so let's customize the icon set a bit. To do this, click More Rules... underneath the icon sets list to bring up the New Formatting Rule dialog. To change the order of icons, click the Reverse Icon Order button. To hide the cells' values, select the Show Icon Only check box. To assign icons based on a cell's value instead of specifying a number or percent, type the cell's address in the Value box or click the Collapse Dialog icon to select a cell, as shown in the screenshot below. 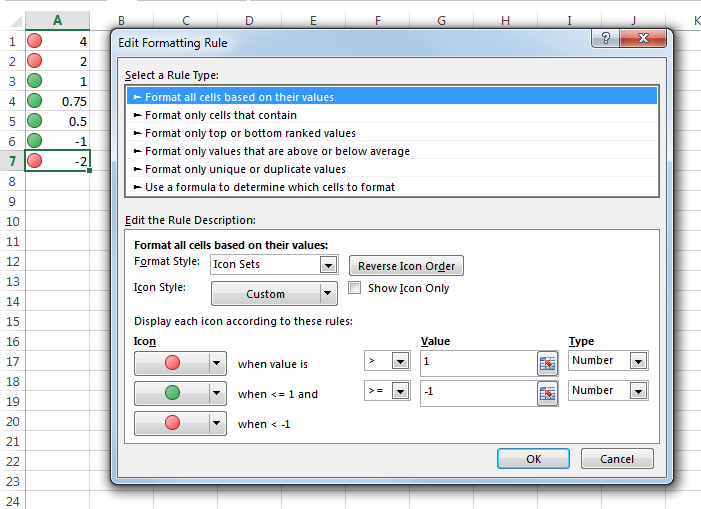 A common opinion is that Excel conditional formatting icon sets can only be used to format cells based on their own values. But this is a delusion. With just a little creativity, you can assign icons depending on the values of other cells in a row or based on another cell's value, as demonstrated in the following examples. Add an empty column in front of your table (Column A). Copy the following formula across Column A: =COUNTBLANK(B2:F2), where F is the last column in your table. This formula will count the number of blank cells in each row. 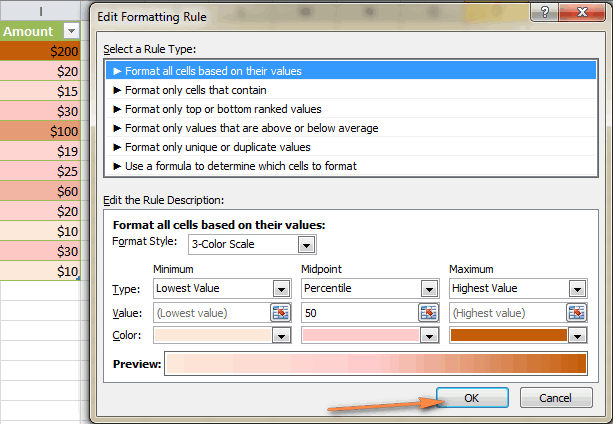 Apply the conditional formatting icon set rule to Column A by clicking More Rules…, as explained above. Click the Reverse Icon Order button to change the order of icons. Select the Icon Set Only checkbox. For the cross icon, set >=5 (where 5 is the number of columns in your table, excluding the first "Icon" column). For the exclamation mark icon, set >=1. Set Type to "Number" for both icons. Suppose, you have a list of orders and you need to add a green flag to column A when a certain product is delivered, i.e. there is any value in the corresponding cell in column D (Delivery Date). If there is no value in column D, a red flag should be placed in column A. In fact, this example is very similar to the previous one, with the difference that you apply a 2-icon set based on the value in another column. And again, you start by adding a formula to column A. This time we will use the IF function: =IF($D2<>"",3,1). The formula says to put 3 in column A if there is any value in the corresponding cell in column D, otherwise put 1. Naturally, you will need to replace D with the column you base your formatting on. Click the Reverse Icon Order button to change the icons' order. For the green flag, set >=3. For the yellow flag, set >2. As you remember, we do not really want a yellow flag anywhere, so you set a condition that will never be met, i.e. a value greater than 2 and less than 3. And here is the result of your effort - the green and red flag icons are added to column A based on the value in column D.
You use conditional formatting Data Bars to represent data graphically inside a cell. The longest bar represents the highest value and, as you can easily guess, shorter bars represent smaller values. Data bars can help you spot large and small numbers in your spreadsheets, for example top-selling and bottom-selling products in your sales reports. 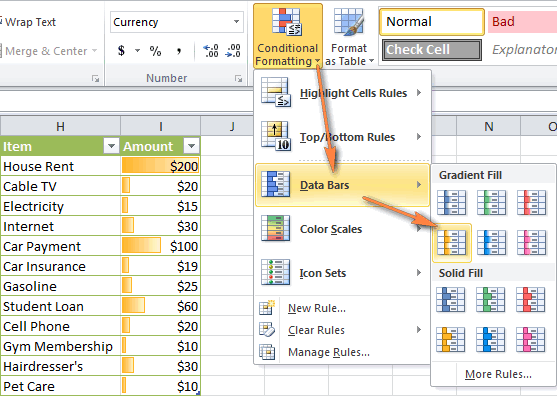 You apply data bars in Excel in the already familiar way - simply select the cells, click Conditional Formatting > Data Bars and choose the bar type you want. Once you do this, the colored bars will be placed inside the selected cells. As you can see in the screenshot above, Excel conditional formatting data bars work very well to visually show your household spendings. Place a check in the Show Bar Only checkbox to hide the cells' values and display the colored bars only. To select the Minimum and Maximum data types, click the little black arrow next to the corresponding box. While the Automatic type works fine in most cases, you can also choose some other data type such as percent, number, formula, etc. Experiment with Fill color, Border and Bar direction and click OK when you are happy with the Data Bar Preview. Using conditional formatting Color Scales, you can format your cells with two or three color gradients, where different color shades represent different cell values. But if you really want to impress someone and have the time and desire to experiment, try out the More Rules... option again and play with the colors a bit. First off, you choose either a 2-Color or 3-Color scale, then select your own colors and assign them to the minimum, maximum, and midpoint values. In the next article we are going to investigate arcane twists of Excel conditional formatting formulas, please stay tuned! 131 Responses to "Excel conditional formatting Icon Sets, Data Bars and Color Scales"
I'll give an example to hopefully make this faster. In cell AJ161, I have a value of 200. Going down the table (each row is a new parameter for what I'm doing, something is going to be altered), the value of 200 increases by 10 each cell (AJ162, cell value = 210, etc. ), until AJ166. From AJ166 to AJ169 the cell value stays at 250. The value then goes up again by 10 in AJ170. In AJ171, the value drops to 240, and continues to drop until AJ175. What I would like, is to have Conditional Formatting Icon arrow sets, that show if a value increases, decreases, or stays the same, from the cell directly above it, rather than being given a specific number. I hope you are able to help me with this. Regrettably, you cannot do without an additional column. Excel icon sets allow using formulas as a condition, but do not support relative cell references that are needed in your case. 1. Create an additional column. 2. Enter the formula =AJ162-AJ161 to row 162 of the newly created column (assuming row 162 is the first row where you need the icons). 3. Copy the formula to all other cells of this column until row 175 (or the last row where you want to display the icon set). - Select the 'Icon Set Only' check box. - For the green up arrow, set >=1. - For the yellow right arrow, set >0. - Set Type to "Number" for both icons. Thank you Svetlana for the reply, it does help, unfortunately I have several tables (about 10), 22 columns where values may be changing randomly in each table, and nearly 300 rows of parameters (~600 total). Is adding a new column the only possible way to show a change in value or no change? I've looked up other forums where similar questions were asked, and I've seen "IF" or "AND" formulas being put in with the values in a cell, and then giving it an icon to put in if it matches the statement. Is that possible, or am I better simply going over the cells with my eyes, looking for a change, and going from there? Hope my questions aren't confusing and that there is some sort of solution other than adding columns. Of course, you can use IF and AND formulas as well. The problem is that you cannot have both - a formula and your current data - in the same cell. So, an additional column will be needed anyway. 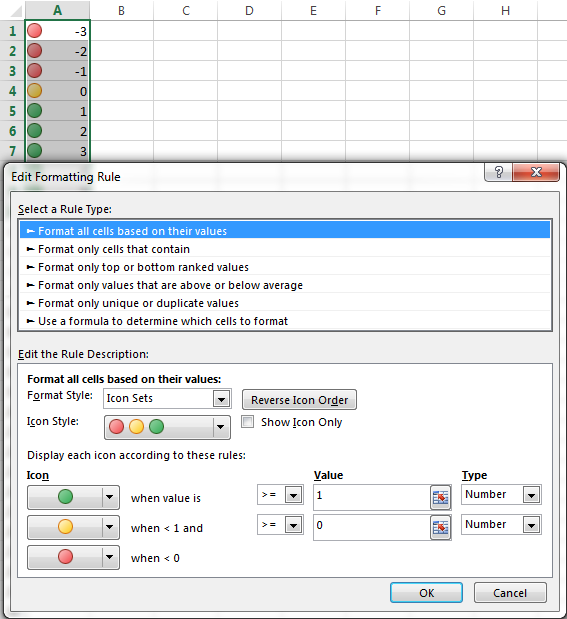 Red (a value decreases): =$AJ162< $AJ161 For step-by-step instructions on creating rules with formulas, please see Excel conditional formatting formulas. Hey, I've been having trouble with the icon sets, i wonder if you could help me. I'm want to add an icon set,the circles red, green and yellow. I want to compare changes in percentage between 1 month and another. I need to set the icons: green for when its equal or greater to 0.01%; yellow: when there is no change 0.00%; and red the the number reflects a negative %. Could you please advice how to do it. Thank you, it will be of great help. I need to know a bit more about your data structure to be able to suggest a solution. Do you have values for 2 months in 2 separate columns? Or, do you already have a column with the calculated percentage of change? Maybe you can provide a sample of your data - what exactly values you have in column A, B, C etc. You can send me a sample workbook at support@ablebits.com and I'll try to help. I have 3 columns: CURRENT YEAR, PRIOR YEAR, CHANGE. I want to conditionally format the Change column so that decreases are in red & increases are in green. Is this doable w/ Icon Sets? Sort of a 2-dimensional icon set: direction of arrow to denote increase vs decrease, but color of arrow to denote impact this change has on bottom line. It's a bit difficult to figure out what positive / negative impact is without seeing your data. If you can send us your sample workbook at support@ablebits.com, we will be able to help you better. Hi there, I am stuck with a small problem I have in conditional formatting and came thru a blog by you and thought of writing here. Here I need to show if the % change in the cost driver is more than 2% higher or lower than the % change in actual price. Our support team sent you a solution by email. Hopefully, it was helpful. thanks for the useful info. After applying the conditional formatting, if we want to copy and paste it into Word or presentations how should be do it. I know we can paste it as image. But, the image doesn't work for me so is there a way to paste it as an excel table where the icons remains in the word as they are in the excel. When it comes to Conditional Formatting, I really was in the dark but after going through the notes I hv now at least seen some light thanks to the illustrations. Only I'm still confused as to why when I assign Icon set to represt values in a cell range which are in percentage type (%) do I have to change type to Number in the Manage the rules dialog box for it to give me the desired results? Sorry, I am not sure I can follow you. Anyway, it is difficult to recommend anything without seeing your data. If you can post a data sample and explain what exactly result you are truing to achieve, I'll try to help. Is there a way to add an extra layer of formatting with the icon sets (ie add a blue circle in addition to the Red, Yellow, and Green options). I have a data set that needs to be analyzed into for different components. Thank You. To my best knowledge, only one icon set can be applied at a time. how to change the colors scale in format style more than three colors. I would like to make the data bars three colors with gradient fill to indicate a change in percentage Red for 0-30% Yellow for 30-70% and Green for 70-100% sort of what the 3-color scale does only in data bar format? Is this possible? Sorry, Nathan, I don't know any way to do this. Most likely this is not feasible. I want to format cell C for each line (list of items we stock) to have a data bar highlighting how close it is to reaching the value in cell B.
I can do this by selecting 'Format all cells based on their values', and choosing the shortest bar as a formula, linking to A, and the longest bar as a formula, linking to B. In addition I also want a format overriding the data bar to show the cell in a solid colour when it reaches the value in B.
I can do this by selecting 'Format only cells that contain', and choosing 'less than' and formula linking to cell B.
I want to copy this formatting to apply to all cells in the same column, but when I try to copy and paste it in the next cell below C, it is linking to the original cells A and B for the formatting, not the one's below them (absolute formulas, not relative). I have read that you cannot set relative formulas when using data bars. Is there a way to apply my above formatting over a number of cells at once, without having to format each one individually? I believe it would be easier for me to suggest a solution if I could see your data. If you can send your sample workbook at support@ablebits.com, I'll try to help. Svetlana - what was the answer to Mary's question - I have same, where I have MtM data in separate columns and want to use Icons to mark if the increase MtM is greater than 10%, Less than -10% or between. How do I sent you the data set? Mary's question was a few months ago and I do not remember the details, sorry. You can send me your data set at support@ablebits.com and I'll try to help. Please also specify in what exactly column you want to add the icons. I am curious about using icon sets to warn me when if I've used a certain number of hours - like a warning if I'm close to using all hours (yellow) or if I'm in danger of going over my hours (red). For example, if I have a value in A1 which is the amount of hours used and A2 has the available hours for use. I want A3 to use icon sets (red/yellow/green) based off of the percentage of hours consumed. 1 Enter the formula =A1/A2 in cell A3. 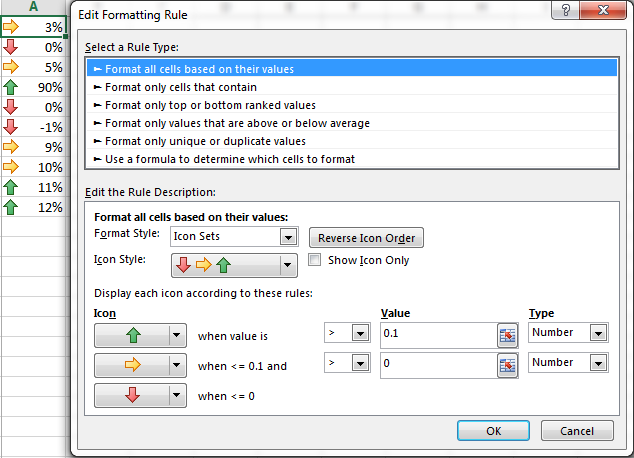 2 Go to Conditional Formatting -> Icon Sets and create a new rule for cell A3. - Click the "Reverse Icon Order" button. - Select the "Show Icon Only" checkbox. Hi, there is some great info here but I can't figure out how to do what I'm trying to do. I have a goal value in cell S9 (this is my daily goal). I have a column of values in C (actual value for each day). I want to compare the value in column c to cell S9 to see if I'm on track to hit my goal. For each cell in the column, if the value in the cell is within 95% or more of the value in S9, then make it green. If it's only 10% or so of S9, then make it red. 50% or so is yellow. I was trying to use a 3 color scale so I get the gradients to tell me if each day is close to hitting my daily goal. If I can't use the gradients, that's okay. Do you know how I can do this? I agree with some of the other commenters that there is some really valuable information found here. I am having some trouble accomplishing something and I was hoping to find some help. I am creating a log for perishable items. In Column F (Expiry Date) I have conditionally formatted the cells to fill yellow if within 30 days of expiry, and red the day of expiry (and beyond). I have Column G (Status) which I would like to conditionally format using a colour scale (3 colours: Green, Yellow, Red) based on the time left (from the dated of entry into the log) until the expiry date in Column F.
I know the expiry date column is already conditionally formatted, but I think the colour scale provides a better visual control for the status of the product and how far into it's shelf life it is. I hope that makes sense. I believe we will be able to help you better, if we can have a look at your data. If possible, please send a sample workbook at support@ablebits.com and specify the expected result. I have a goal value in cell S9 (this is my daily goal). I have a column of values in C (actual value for each day). I want to compare the value in column c to cell S9 to see if I'm on track to hit my goal. For each cell in the column, if the value in the cell is within 95% or more of the value in S9, then make it green. If it's only 70% to 90% or so of S9, then make it Yellow. if it is between 50% and 70 or so is Dark yellow, and if it is below 50% make it RED. I was trying to "use a formula to determine which cells to format" and use a formula, but I fail to do so. Can anyone help me with this? In the formulas, C2 is your fist cell with values. Would this be possible: I have a column with data bars representing a % of YES answers to my questionnaire, but would for example like to show ratio in YES answers as given Female or Male. Now i could do 2 colums, but it would be better if it could be done within the same data bar. I seems not possible, but just to be sure, I wanted to ask. I have a change column and I would like the values to be gradients of red or green if they are positive or negative and then anything = zero to be white/ no formatting. Right now the default gradients will highlight the lowest positive number as red, which makes it look like it was negative. We operate a business that has credit accounts. We update the accounts weekly, but make changes do to purchases frequently. Is there a way to show by using the arrow icons, what type of action was last performed? i.e., was there a credit added or was there a deduction made. Would ideally love for this to happen every time the cell text is altered. I am trying to insert an icon (X, check, exclamation point) into a cell based on the absolute value in another cell of the same row but can't figure out the right way to accomplish this. The value will be a score - 1, 2, or 3 - and the icon would correspond to the value. Can you help? It must be so simple I am missing it! I have a smiliar question as Vicki, from 11/14, but rather than a score value, I'd like for the text in the column to be read and an icon to display in another column. Can the be done or must I use numbers? Yes, it is possible. If you describe your rules in more detail, i.e. what text corresponds with each icon, I think we'll be able to help you with formulas. Ok, I want each column to show the Up, down arrows in comparison to the previous column. For example if the value in B2 is greater than B1 the green up arrow appears in B2. I know how to do this separately, but is there a way to copy and fill series this formatting? can add new icon in excel to use them in conditional formatting? like smileys (emotions for showing progress of any activity e.g. smiling face in completion of activity, sad smiley in case of incomplete activity)?? I have a trend analysis looking at data from Sept-August and a column that ranks the results in the trend 1-12 based on their type. I have conditional formating applied to the column using icons ex. green is for everyting from 1-3, etc. It works great with a data that's there, but when I try and paste new updated data over the trend, the conditional formating in the ranking column disapears and does not work when i try to reapply it. Do you know why that happens and what would be the remedy for it. I want to change format of a cell range, A1 to B10" based on a cell reference, cell A4 and value can be Income or %Income. For Ex. If Cell reference is "Income" then format of cell range should be "Numeric" and if cell reference is "%Income" then format should be "Percentage" for the cell range. I've seen two questions above related to using negative percentages, but have not seen a response. I want to use an up arrow icon for percentage increases above 2%, a right arrow between 2% and negative 2%, and a down arrow for decreases greater than negative 2%. So, I have a data set that compares a percentage from last year and a percentage this year with a resultant percentage difference -- positive difference if if it went from say, 61% to 63% and a negative difference if it went from 63% to 61%. The change, then, is 2% and -2% respectively. Using these figures in the conditional formatting, I get an error message from Excel saying that "one or more of the values is not a valid percentage." Does Excel not allow a negative percentage? I have the same problem. did you ever get an answer to this? There is specific set of icons. I want to use my own customized icon set. Is there any possibility of customized icon set in conditional formatting? Is it possible to apply a color scale conditional format based on values, but then have text in that cell that differs from those values? This would be like in your example above if the expenditure categories themselves were shaded (e.g. House Rent dark green, Car Payment light green, etc.). I know that the conditional formatting depends on the numerical values, but can the numbers be somewhere behind the scenes while the text in each cell gets shaded? Let's say column A has a unit cost that I need to multiply by 15% to give me the new unit cost in column B. Then I'll need to multiply the new unit cost in column B by the quantity in column C to give me a grand total in column D. How do I write a formula in order to achieve this? There are 166 rows of unit cost in Column A and 166 quantities in column B. Please help. So I am trying to use ICON sets to conditionally format percentages. What I am doing is calculating percentages of certain measures by calculating a Budget target versus and ACtual performance. I am putting the % of attainment into a cell by entering a formula similar to A1/A2 to return the % of attainment. When I go to create the Icon Sets I want a Green Arrow to show next to the result if attainment was 100% or better, a sideways Yellow arrow if attainment was between 90% up to 100% , and a downward Red Arrow if attainment was lower than 90%. My issue is, once I have set up these parameters only Green arrows show up regardless of the value of the data in the cell? What am I doing wrong? I've tried to apply the icon sets to the variance report for my budget. As this is the capital expenditure budget for the period I need to monitor the budget at each asset category level and department level to alert on their budget consumption. I have sent an email to the support team. Please check on this matter. Select your data and create an Icon Sets rule for three icons. To choose the icons, please click on a small arrow to the right of the icon. I am trying to show icons for what I would think would be a simple task but I can't seem to make it work. In column "N" I have a current rate percentage. In column "O" I have a target rate percentage. I want to use the icons to show a green check if the target has been met, a yellow exclamation point if the target has not been met, and a red stop light if the current rate is 50% or more below the target rate. Basically just showing which rates have been met, are almost there, and are in danger of not being met. I am trying to figure out what type of formula I would use. I have a spreadsheet where I input data. As long as the cell has data in it, it turns green. I want to be able to keep track of what percentage is green in another column. The cells that have information in it are green while the other cells are red. How do I make a formula for the percentage cells based on the color the cell is? How do I format a certain cell to change to a chosen colour depending on the wording in another cell? Is this possible? For instance, if cell A says YES then cell B turns green but if cell A says NO then cell B turns red? Is there truly no access to "color scales" (or an equivalent function under a different name) in Excel 2008? I no longer have 2007, and I'd hate to have to buy a new computer just to get space to add Office 2013 (and don't know if anyone will still sell me 2007 or 2010, and not sure 2011 is quite compatible). Sorry, I have never used Excel for MAC, so I am unable to help with this. According to the following page, color scales exist in Excel for Mac 2011, but there's no mentioning of earlier versions. Also, this page is very helpful, as is the rest of your site. Is there a way to send you a couple of dollars for the benefit this provides to people who are not regular paying customers? This is a few thousand times more helpful (and less painful) than microsoft, apple, or any other paid support. Where you have used Icons above, to the right of the examples shown there are boxes with keys/descriptions as to what the icons actually mean. How do I get the same? Is this some automatic function? Yes, this is the default functionality. In fact, these descriptions reflect your settings, i.e. the values and logical operators that you choose for each icon. You can try creating a new rule (Conditional Formatting > Icon Sets > More rules) and you will see that the descriptions change as soon as you change a value or logical operator. Is there any way that i can drag Icon set conditional formatting to other cells also ? When you apply data bars to a range of cells, Excel treats the maximum value in the rage as 100%, so the scale simply cannot go any higher than 100%. In your rule, you can set the Minimum and Maximum Type to "Percent" and the Maximum value, say to 70. In this case, 70% and above will have the identical bar length (entire cell). I am currently trying to create relative references on conditional formatting icons as well. I had an idea of possibly using the INDIRECT() formula to accomplish this.. not sure if it is possible, but thought I'd run it past an expert. You can use the INDIRECT() function to create relative references in Icon Sets rules. The key problem is that the rule must be applied only to ONE cell, in this case the formula will work correctly. It means that for 10 cells with icons you need to create 10 separate rules. I am trying to change the conditional formatting rules, to have the 3 color sets only apply, I do not require color to scale at all. Is there a way to have conditional formatting change this, I tried doing various ways, nothing seems to work, have you encountered a similar request and will you be able to help. How do I change the colour of a icon set I want the quadrants but in blue instead of black? It's not possible to change the icon's color because they are "hard coded" by Microsoft. I want to use flags on a cell 'A' based on a dropdown list (green, ornage or red), when I select any color, the corresponding flag is not displayed. Where A2 is the top-most cell with a date. Can we change the Icon Color based on our requirements in conditional formatting. Nope. You can only choose from the predefined icons. I'm having trouble with 3 colored arrows, when applying the previous solution I do not get the expected results; Formatting is in Column C, when it's positive I want green arrow, when negative red and zero value should be marked with yellow arrow. e.g. for negative value, -13.94% i'm getting a Yellow arrow and it should be marked red. I'm making a wrong rule but i'm not seeing the mistake. Any help would be appreciated. Hello! Thanks for all the great info re conditional formatting, very helpful. In my case, conditional formatting works perfectly based on the parameters set and I have the spreadsheet set to display the icons only. As an added benefit for soft copy readers, I'd like the data value of the cell to be displayed when the mouse hovers over the cell. For example, the resulting data value of cell A10 is +10bps and a green light is displayed but the value is hidden. I've seen other spreadsheets (creator is not available) where I can hover my mouse over the cell and +10bps is momentarily displayed. Thanks in advance for your help! I have created conditionally formatted icon sets (stoplight) for an array of data. I would like to set up a word mail merge and have the icons (red, yellow, green stoplights) appear in the word doc on mail merge. Instead I seem to only be getting the value of the cell. Any help? I'm that you are helping everyone in the forum with solutions for their question. 3. If the values are <0 % It must be represented by a downward arrow. - Show upward arrow when the value is >0 and choose "Number" under "Type"
I want to make a checklist, is there a way to put a checkbox before each item and have code that if there is a check mark in the checkbox it highlights whatever the cell (not row) is to the right of the checkbox? I want to use a text value to trigger a conditional formatting icon. Text value being red =(red dot), yellow = (yellow dot), green = (green dot). Can this done? I want to set a cell can display the cut-off time itself and use solid fill function to show may time left. For example, our time start from 8:30 AM and one of our counter's cut-off time is 9:30 AM. I want this cell always display 9:30 and the data bar will become shorter base on time pass. I have a spreadsheet and I am trying to automate a row that will show a green arrow up or red arrow down depending on the relationship between the 2 previous columns. So if the # in column A is greater than the # in column B, I want a green arrow in column C. And vice versa. Any help would be appreciated. I have played around with the Rules under Conditional Formatting, but can't seem to find one that fits what I am trying to do. (Excel 2013) Thanks. I am trying to create an excel chart has a date column (Column A) and tasked organizations (columns F thru AB). I am trying to format it so that if the date passes, the organizations that are tasked (not all are assigned at any given point) the box will automatically go black/overdue. Until that date, the box should just be yellow or "pending". I am really confused and tried multiple sites. I am using Excel 2013. I am using the Data Bar in Conditional Formatting and my data contains percents. I want the length of the bar to be relative to 0% to 100% but the length of the bar is always relative to the highest percentage value in my data. I've tried changing all the minimum and maximum settings but have not found a fix. Is there a way to do this? I have conditional formatting on column N which fills different colors based on containing word on it. I want same color to fill on the column A:M based on column N color. Tried many ways to get the same color from formatted column but not succeed. Is there any way to get same color from other the cell? Please help me on this as i am getting a down arrow for 33% as well? Also, i have a formula for that particular column and it is formatted to %, the conditional formatting doesn't work. However, if i change the format to number, apply conditional formatting and then convert the column to %, then it works. Why is this happening?? What is the problem with applying conditional formatting in % formatted cells? Hi - conditional formatting was working well on the data I pulled in to my sheet via a CSV URL feed. The publisher of the feed changed the CSV format (putting the header rows on the bottom--causing me to have to reverse the rows in order to use the first row as the column headers--no big deal there); however, now the conditional formatting no longer works. All the data / columns still the same but it's as if Excel no longer recognizes the type of data in the column--raw from the CSV or formatted manually in Excel. Seems it won't recognize the format. Could formatting be an issue why conditional formatting STOPS working? Please help me.. i try to make custom icon in conditional formatting, but it cant be save..after reopen the file, the conditional formatting formula not shown..
Hello, I have an excel pivot table that has pulled in data from a sharepoint dashboard file. The cell content indicates RAG of Green, Yellow, Red. Is there a way to apply conditional formatting to interpret those rags and provide icons? i have a table consist of 3 columns filled with numbers. i want 3 icons which tell me which data value is maximum, which one is minimum and which is between them? muted green, not a normal red, yellow, and green as I see in the screenshots above. I tried changing the Theme, but no change. What can I change to get the more traditional colors for the traffic lights? please I would need your expertise touch here. I have three cells (say A1, B1 and C1) . A1 is titled "%completed"; B1 "%Tartget" and C1 "Rating/Status"
I would like to be able to compute (use nested if to determined the status of the two cells if the difference btn cell A1 and B1 meets a condition. ***This explains how the ratings are computed. the above is working fine for me but there are instances where cell B1 (%target has a mark of say 48 which will not be achieved according the above creteria. Please who can achieve this ? Suppose i have created a table where i will update my data daily or weekly wise. Now i want to create another chart or table which just shows a particular color corresponding my values in the table i created but not the value itself. Is there any formula for that in excel. I want column D highlight (Red, Amber, Green) based on Purposed date if the issue date past purposed date highlight red on column D, and if competition date is before purposed date highlight Green on column D or else Highlight amber if Issue date is not exceed purposed date. I want to show icon set in D6 and D7 comparing to D8. so for example D7 is less than D8 so Green up arrow but D6 is greater than D8 so red down arrow. I want to show icon set in D6 and D7 comparing to D8. so for example D7 is less than D8 so Green up arrow, if it was greater than D8 red arrow down but D6 is greater than D8 so red down arrow and if it was less than D8 then green arrow up. More than three colours (actually 5) here, any advise on how we can get around to get 5 different coloured circular icons?? I could really use your assistance. Is it possible to apply an Excel icon set based on the sum/difference of another cells formula =IMSUB(E2,F2)? this is for a running inventory sheet. E2 would be starting stock, F2 would be number of stock used, G2 then shows current stock. I want cell G2 to show icons according to the result of =IMSUB(E2,F2) Thank you for any help. I have a row of data containing formula that returns a number. I have applied the icon sets to return an icon based on <33rd,67th percentile but when I manually check the sets based on the colours that should be showing they are wrong. Is there anything obvious i should check for? I have copied and pasted values but still get the same result. Hi Need help with the below. I have created a conditional format for one of the cell where the cell, if the cell value is great than the value from the last week show Up arrow, if the same cell value is lower than the value of the previous week show Red down arrow. I am not able to copy this conditional format to the other cell as conditional format marks the initial cell value as $ so when I copy the format it still looks up the first cell from the previous week. Please help. I wonder if i could do thing like : if cell A equal to cell B format cell C with a symbol tick, if the two cell are not equal format with a symbol X and if i have nothing in cell A or cell B format with symbol!. any help ? Can i change icon colour? I am not an advanced Excel user but I wondered if you could help. I have a budget sheet that runs on month after month and I use filters to see what I'm spending in the current month (by filtering out all the previous months). I also assign a different category as I enter each invidual expenditure (food, petrol etc). I also have the monthly budget total for each catagory on a separate sheet. What I would like to do is see easily, at a glance, when I have spent each budget - whether this is using icons or simply having a list of categories that decrease in value as I spend. I can do this manually by using filters and cross checking on the separate budget sheet but is there a way to do this automatically using forumulas? Please help me to make the icon sets for below calculation. I would like to use two columns.first one will have temperature data, second one will have symbols like (Suspect or good).Every cells at second column will check the data which at tle left cells at the left column and if there are persist data more than determined number( l will chose it like if there are 10 same temperature data next to next) than will write SUSPECT at the righ column cell . One question... it's possible to display in a gantt chart a mailstone with flag that use color variable green red or yellow flag in function of status value ? I am trying to make a "% completed" column using progress bar that is dependent on "Status", which are of texts instead of numbers. My question here is, is it possible to create progress bar with "Status" e.g. "Stage 1" displaying 10% on the progress bar? I have tried to use IF formula to relate the "% completed" column to "Status" column, i.e. ; =IF($C$6, 0, IF($C$7, 10, IF($C$8, 15, IF($C$9, 20, IF($C$10, 40, IF($C$11, 50, IF($C$12, 60, IF($C$13, 65, IF($C$14, 70, IF($C$15, 80, IF($C$16, 90, IF($C$17, 95, IF($C$18, 100))))))))))))). However, the result is #VALUE! please see if the formula for the same is pre-fed or has to be calibrated by combining formulae.